Cover with water, bring to a boil, and cook over medium-high heat until very soft, about 20-30 minutes. While cauliflower cooks, cook minced onion and garlic in olive oil in skillet over low-medium heat until very soft, about 15-20 minutes. ‍Drain cauliflower and transfer to food processor or blender, along with onion and garlic and any reserved oil in pan. Add 1-2 cups water, and puree at high speed, until very smooth and creamy. Carefully add reserved pasta water while blending to create desired consistency; the pureed vegetables will yield almost a soup-like thickness, so add water as desired. Return to stockpot over low-medium heat, and stir in desired amounts of grated cheese, freshly ground black pepper, and crushed chili flakes, adjusting cheese and seasonings to taste. Stir cooked pasta through seasoned sauce until heated through. Distribute among serving bowls, and top with shaved Parmiggiano pieces and a last grind of black pepper and pinch of crushed chili, to serve. Buon appetito! *Roast 4-6 cups of fresh (firm) cubed vegetables (zucchini, yellow squash, bell pepper, eggplant, carrots, etc), tossed with oil/salt/pepper, on baking sheet coated with oil or cooking spray, at 400F for about 20 minutes while preparing pasta and sauce. Add to seasoned sauce with cooked pasta, and heat through to serve. You may also cube favorite vegetables,and include broccoli pieces. Boil with pasta to cook. Or, if you prefer crisp-tender, place vegetables in colander, pour cooked pasta over to steam vegetables. Heat cooked pasta and vegetables through with seasoned sauce to serve, as directed above. In a previous life - not all that long ago - I was Tapas Bar Chef at BarComida in Redondo Beach. Most recently, one of said lovely people asked to engage me as“Pasta Chef” for an upcoming wedding rehearsal dinner. I am always honored by these requests! Even better, it turns out that my client’s family owns Valente Pasta, so our menu will be supporting the home team! 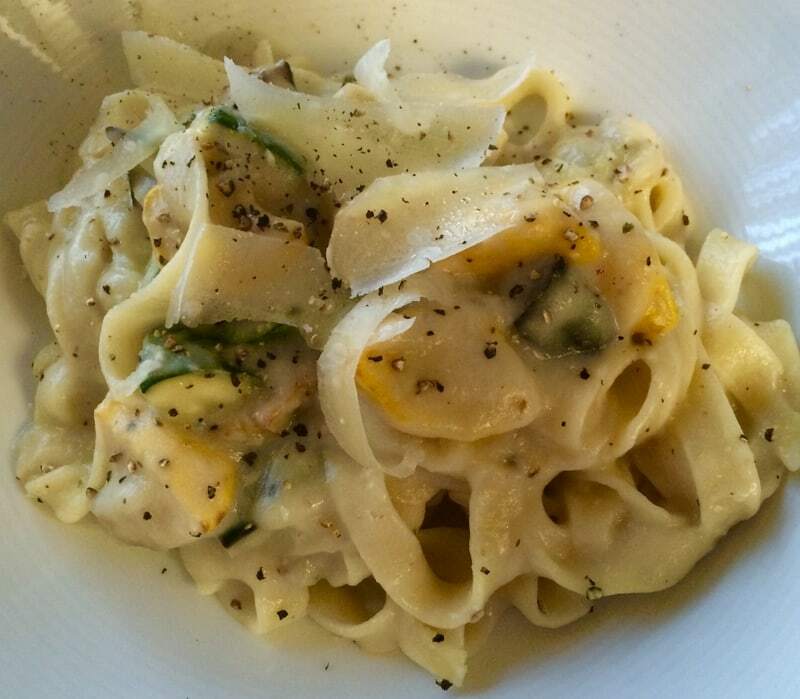 Lo and behold, while exploring their site, I found a fantastic “Vegan Pasta Alfredo” recipe that I just have to share. I’ve adapted it slightly for my own taste, which I’ll explain in a moment. As one who is very much NOT a fan of cauliflower, I was amazed at how delicious - and clearly very healthy - this rendition is, considering authentic Alfredo sauce is made with copious amounts of heavy cream, butter, and cheese. In my experience, this recipe worked best by boiling the water for the pasta, while preparing the cauliflower and sauteing the onion and garlic. While the pasta is cooking and as it’s done, you can be adding ladle-full portions of the the starchy water (up to 4-6 cups) as the perfect agent for thinning the sauce of the pureed vegetables. For the record, I did use - and do recommend - traditional egg fettucine noodles, because I think the original Alfredo would appreciate that. Enjoy the recipe, and stay tuned for more Appetizing News!